Wine Twister A clever twist on aeration, this great little 5-in-one gadget breathes life into your wine by oxygenating it as it's poured. Using patented Oxi Pour Technology, the torpedo-shaped funnel expedites the aerating process in a matter of seconds, opening up your wine to its full range of flavors and aromas while softening the tannins. Offering 5 functions in one, it instantly aerates, prevents drips, facilitates flow control, provides 360° pouring from any side and doubles as a wine stopper. Whether poured into a decanter or by-the-glass, it heightens the pleasure of your wine, opening and closing with a twist and forming a vacuum seal that keeps the bottle fresh for up to five days. Fits all size bottles. Rubber coated, it's made of stainless steel and ABS plastic. does this fit screw top bottles? Does it measure the pour? BEST ANSWER: No, the Wine Twister does not measure the pour. No. It's just an aerator. Gloria g says it is the best 8.00 she ever spent would like to know where they are 8.00 would like to buy quite a few and give as gifts would be great at 8.00 for each.? BEST ANSWER: The Wine Twister is currently offered for $14.95. Dependent on how many you would like to purchase, please call our customer service department at 800.648.6058 and they can assist you with any pricing issues. Not really a question, save maybe for Amazon or the supplier. I will say that the effectiveness of this device isn't close to the more common aereators. And it has a tendency to "leak". Does it work for white and red wine both? BEST ANSWER: The Wine Twister can absolutely be used for both red and white wine. I suggest rinsing out the wine twister with warm water if you switch back and forth between white and red varietals. Yes, it works for either one. Does this filter the wine? BEST ANSWER: There is no actual filter on the wine twister. It does aerate the wine, and I have noticed less sediment when getting to the bottom of the bottle. It seals nicely, keeping the wine fresh for awhile if you don't drink the wine quickly. Hope this helps. There is a small screen at the top and does aerate the wine. Does this "wine twister" run on batteries??? BEST ANSWER: No it does not run on batteries. does this aerator have a sleeve to store/transport it? BEST ANSWER: Unfortunately we do not have a carrying case for this unit. Any other questions please call us at 1-800-356-8466. 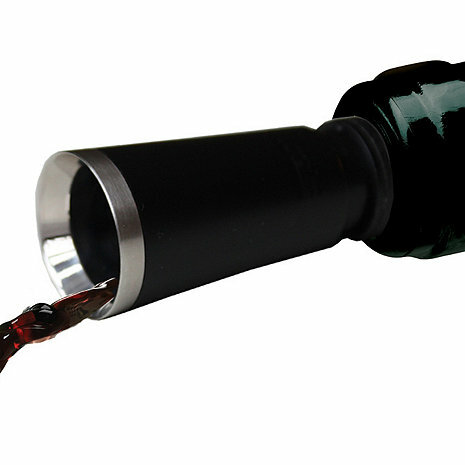 The Wine Twister aerator does not include a storage sleeve. Can I come shop at your store or warehouse in New jersey? BEST ANSWER: We prefer you place an order online and then pick up your items from our warehouse in New Jersey. We do have a showroom in Valhalla, New York you can visit where we have some of our items on display. Saw this at a friends house and ordered one as soon as I got home. It does exactly what it says! Use it with every bottle of wine we have at home. The price is reasonable, and I like that I don't have to change tops as this dispenses and seals the wine until the next use. Gives the wine nice aeration. We have purchased six! We are very pleased with this product and recommended it to a friend who also purchased several. This product definitely pours the wine without dribbling. And you can just turn the top and it instantly seals the bottle. And it was cheap. But I bought it to "aerate" the wine because I'm too impatient when I open a bottle of red to let it breathe for an hour or so. And on that point, I'm not sure. I tried it out, opening a bottle or two, immediately pouring a bit into a glass and tasting then popping this thing on pouring a bit (into another glass) and tasting. Not that much difference. I did see some difference if I A) let the bottle breathe for 15 minutes and then B) doing a little dribble pour to maximize the amount of air to wine that would get mixed or whatever goes on inside that thing. Bottom line: It's cheap! It doesn't break (some of its fragile glass-tube competitors look like they were made for smoking "herb"). It's fun to experiment with. It pours nicely. People are impressed. it also seals the bottle. And did I mention, it's cheap. So why not? Bought a condo and wanted something to replicate my current aerator, but take up less space. This "three trick pony" (stopper, pourer, aerator) seemed right (and took up far less space). And all of that is true. But I was mainly interested in the aeration aspect and, in that regard, my personal taste suggests it doesn't do nearly as good a job as a dedicated aerator. I'll keep using it, but won't buy another one. Others trade-offs among the "tricks" may be different from mine. Great addition to our wine items. Pouring is easy and love the added feature of aerating and corking all in one. I am so pleased as to how well this tool works. We even did a test. We poured a little wine without using the twister. First we sniffed the wine and compared it to the glass using the twister. The smell was different. Then we tasted the wine which had been poured without the twister and compared it to the wine poured using the twister. It definitely tasted better using the twister. What a great little tool. I recommend it highly when you don't have time to decant. ( WHITE WINE IN REFRIGERATOR). WILL GIFT 2 OF THE 3 I BOUGHT, BUT WILL NOT REPURCHASE ANY MORE. Works great no drips, cleans up easily. I am glad I bought two extra. I really like this twister; so easy to use; aerates the wine directly from bottle to your glass. Very convenient. This was the best $8.00 device I ever purchased and works perfectly. Will order more for xmas exchange gifts for workplace. I also have a Decanter but when I'm having a glass only for myself or taking a bottle to someone else's house the twister is used and it does a wonderful job. This wine twister is by far the best product of its type that I have owned. It is very easy to use. Nice to have the ability to aerate your bottle and close it up if you do not finish it all. Convenient and does the job s described.